Development of infrastructure, new construction projects, entrance of new lighting companies & increased marketing expenditure have been the key factors driving the growth in UAE LED Lighting Market. 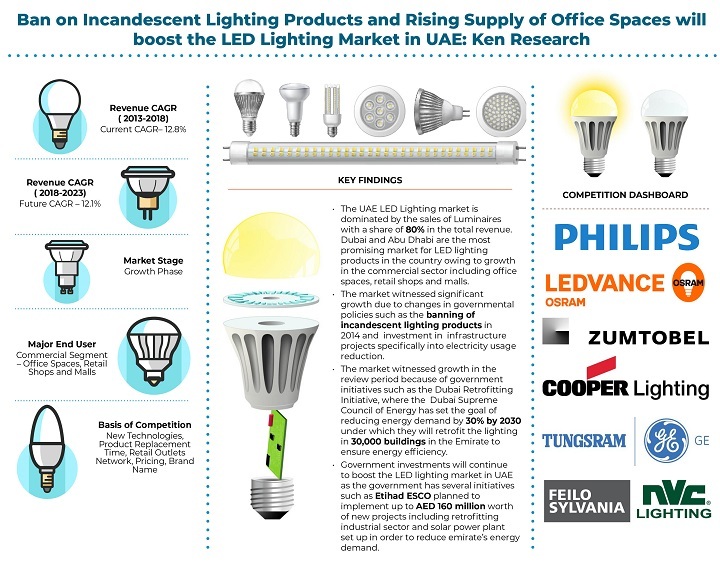 The report titled “UAE LED Lighting Market Outlook to 2023 – By LEDs Lamps (LED Reflectors, LED Tubes, Others); Luminaires (Downlights, Troffers, Outdoor Area Lights, Roadway Fixtures, Spot Lights and Other Luminaires), By Usage (Indoor and Outdoor), By End Users” suggests that the growth in construction space and the government initiatives to reduce the CO2 emission and electricity consumption by installing LED lighting and banning incandescent lighting in the country in other applications as well. The market is further expected to grow registering a CAGR close to 12% in terms of sales value during the year 2018-2023. Market Overview: UAE LED Lighting market is highly fragmented with more than 150 players present in the market. The market demand is driven principally by imports from various countries specially China and Malaysia. The market is highly dependent on the real estate industry in the region and witnessed a slow growth period from 2008-2012 as the construction industry was badly affected with the 2008 sub-prime crises. The market started to revive when the real estate industry caught some pace in 2012. In addition, there were major changes in the type of lighting products that were allowed to sell in the market in 2014. These changes in product specifications created a demand for a new product in the market; this helped in building the market for LED Lighting in UAE. Market Segmentation: UAE LED Lighting industry revenue increased at a CAGR 12.8% during 2013-2018. The market was fuelled by increasing government expenditure on the upgradation of traditional lighting with the LED lighting products, increase in the construction of commercial and hospitality buildings, retrofitting of major areas and locations with the LED lighting lamps and luminaires. The distribution channel used by the companies are generally exclusive distributors, lighting showrooms, utilities and others where others includes channels such as direct sales and small retailers. The major part of the total LED lighting sales in the country, consisted of the project sales. The commercial sector is the biggest end user of LED lighting and demands almost half of the LED lighting sales in the region. This was owing to factors such as the digitalization of the lighting technology with keen focus on adoption of new technology trends such as Internet of Things, Mobile Application Support etc. Competition Landscape: With the ban of incandescent lighting in 2014, the market for LED lighting boomed in the region. The market is mainly dependent on imports. Companies generally import the raw material and assemble the product in the country or they directly import the finished product in the region. The market has the presence of some big global players such as Philips, Osram/Ledvance, Cree/Ruud Lighting Arabia but no single company is able to dominate the market and the biggest company doesn’t even have the market share of more than 10% in the region as of 2018. The sector demands investments which has restricted the growth of domestic companies. The market is also facing increasing competition from exporters in China, which are supplying the market with low cost products and are further reducing the profitability for the present players.